Kasoma’s fortunes were to change in rather dramatic fashion when he grabbed a rare opportunity, that came his way in 2010.even years ago, Noordin Kasoma chased his dream of becoming a professional cyclist and perhaps take part in some of the most competitive races in the sports world, such as the Tour de France, to name just one. “It was in 2010 when cyclists were invited for a seminar organized by Entrepreneurship Institute Rubaga where I met the renowned bicycle designer, cyclist and hi-tech manufacturer of bikes Craig Calfee. He taught us how to manufacture bikes from Bamboo. I found this as an amazing opportunity that I could not let pass,” Kasoma said. Kasoma’s interest in venturing into bicycle manufacturing arose from the growing awareness about environmentally-friendly lifestyles of people such as cycling for movement as opposed to use of carbon emitting vehicles, especially in the developed countries. “As people become health and environmentally conscious, they want to cycle more and use renewable resources,” argues Kasoma. 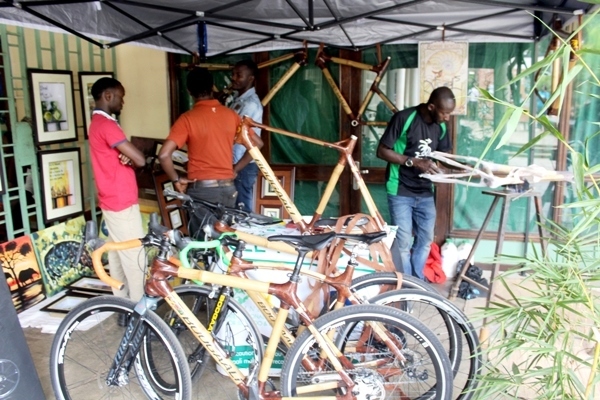 Besides, it was a pleasant surprise for Kasoma to learn from Calfee that a natural material such as bamboo, easily grown in many parts of the Uganda and the world, could be used to produce something as durable as a bicycle. More great news was to come in the way Calfee wrapped backcloths to bind two separate bamboo sticks into a very durable joint. In fact, as Kasoma later found out, the crisscrossing nature of fibre threads in backcloth, gives it an edge over other types of fibre like sisal. “We use backcloth to make joints because it is the best form of natural fibre compared to other material. It has given us an edge in the market over other bikes,” argues Kasoma. Kasoma pursued his dream by establishing a close relationship with Calfee on how he could develop the dream further, including finding out the nitigrities of bike manufacturing and marketing. With support from Calfee Kasoma founded a private company called Boogaali bikes ltd and started to make bikes destined for the European and American market. 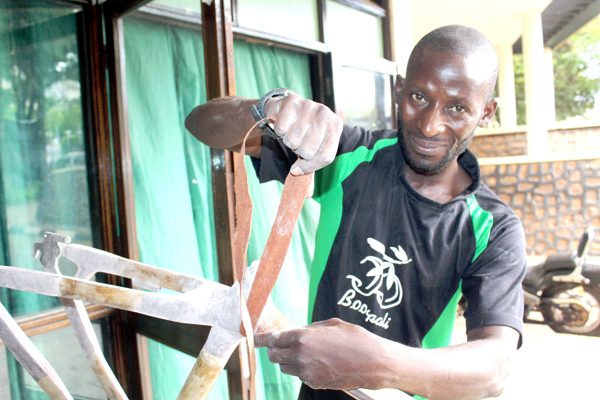 The idea of making a bicycle frame from bamboo might sound very attractive. However, it’s not as easy as eating a piece of cake. Making a bamboo bicycle frame is a careful multi-stage process that lasts several months from the time the bamboo is harvested. It involves cutting the bamboo, drying, curing, joining, filing, filtering, alignment, smoothing, automotive clearing and coating. The entire process is purely an exercise of handwork and therefore requires meticulous and skilled personnel to put it to perfection. “We leave the bamboo to dry for three months In order to process the frames. The bamboo is measured every after two weeks to monitor their weight and moisture content. Later, we cut them onto respective sizes according to the required specifications. For example racing bikes have different sizes need to be very light compared to casual bikes. He notes that they are able to produce frames weighing around one kilogram for a racing bike and slightly more than two kilograms (frame) for a casual bike. Kasoma specializes not in assembling a complete bike, but rather in the production of frames, which he exports to Europe and the United States where he sells them to bike shops. We sells our frames to Europe and the US where our clients are owners of bike shops. What they need from us are the unique types of frames to which they add other parts to assemble a complete bike. The fact that they are made from renewable material does not make them cheaper. According to Kasoma, their clients are generally rich people who want a different type of bike, from what they’ve grown up seeing. “The unique nature of our frames made from bamboo and backcloths, gives us a niche in the market where most people are used to frames made out of alluminium, steel or carbon fibre. If other modern parts of the bike are added, the bike costs a mindboggling US$2000, (Approximately UGX7.4m). Currently, with a workforce of about 10 people, Kasoma says they are able to export some 40 frames per year. This level of output, he says allows him to put food on table and meet the needs of his family besides paying the salaries of his colleagues. As observed, he targets the elite class in Europe who care more about quality than quantity. As such, he does not intend to adopt a mass production strategy, especially also since the market for unique hand-made products remains weak in most parts of the developed west. Going forwards, Kasoma says he plans to set up a physical showroom in Kampala as one of the ways to expand his market opportunities, even though he gets most of his orders from online.